The Starks of Winterfell have long been the last bastion of civilization in the northern part of Westeros. They are proud, loyal to their brethren, and sworn to protect the country from any foe. With the onset of the War of Five Kings, their gaze has turned from the northern frontier, and it now faces south toward King’s Landing. The bannermen have been called and the Starks are marching to war. This month, their forces in the A Song of Ice and Fire: Tabletop Miniatures Game will be bolstered with four new unit boxes. Let’s take a look at each. The Starks are known to be dependable, resilient, and above all, loyal. This goes double for their leaders. Each one under the Direwolf banner is an expert in some part of military engagement. Rodrik Cassel and Howland Reed can lead individual units on specialized roles. Brynden Tully and Eddard Stark are at home controlling the overall force with tactics and strategy. And the presence of Bran Stark and his companion Hodor and the direwolf Summer, instills courage in the troops. All of the characters in the Stark Heroes 1 box will come in handy in the war for the fate of Westeros. Some units can be judged on their military skills or strength, but in war, when another army is advancing, loyalty is a much more valuable asset. 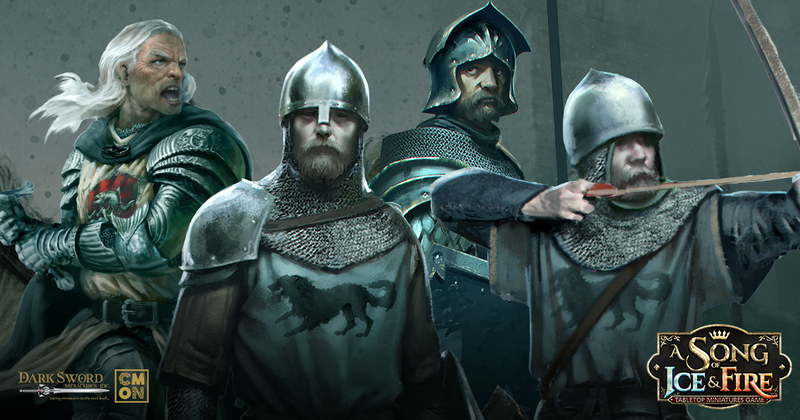 The Sworn Swords are the bedrock of the strategies of the Stark commanders. They are brave and capable to be sure, but their loyalty to the Direwolf banner can never be questioned. To a man, they would rather perish in battle than leave one of their brothers behind. These warriors have waited in the frozen North too long, dreaming of battle. Now is their time to march to war. In battle, if you can attack your enemy and they cannot retaliate, that goes a long way to victory. For House Stark, that means employing skilled bowmen in their ranks. They have trained relentlessly in their everyday lives as trappers, rangers, and hunters. Now, they form up and send out steel-tipped death to the foes of the Direwolf. The Stark Bowmen Unit Box provides a long-range option for Stark commanders. Though very lightly armored and not equipped for melee, they more than make up for it with their ability to put volley fire at enemies. They can even ignore line of sight requirements, arcing their arrows high into the air to strike at hidden targets. The great Houses of Westeros have strong friendships that they rely upon. These bonds could be quite strong, reinforced by marriage. When House Stark sent out its ravens to call their Bannermen, House Tully was quick to lend their arms to the cause. In battle, the Sworn Shields would lock their shields together, side-by-side, creating a nearly impenetrable wall, on which even cavalry charges could be halted. The Tully Sworn Shields unit box gives House Stark players a bulwark on the battlefield. Sworn Shields can utilize their Shieldwall order to negate hits to their front facing, dulling an enemy charge or subsequent attacks against them. Meanwhile, their trusty longswords will show that this unit isn’t entirely defensive in nature. The forces of House Stark are all examples of the overall House’s ideals of strength, integrity, and honor. They fight bravely, and almost never falter on the field. Their leaders are strong and know that the cause they fight for is just. Woe to those that stand against the Dire Wolf in battle. These unit boxes will be available September 28. You can read more about the Stark Heroes 1 set here. You can read more about the Stark Sworn Swords set here. You can read more about the Stark Bowman set here. You can read more about the Tulley Sworn Shields set here. You can read more about the A Song of Ice and Fire: Tabletop Miniatures Game here.